SSL certificate will protect your reputation and visitors of your website. Hackers won’t steal their credit card information, usernames and passwords. Suitable for private use. Secures 3 domains and all subdomains of 1. Buy up to 97 more. When you visit a website, your browser connects to the web server which is running this specific site. If connection is not secure, hackers can steal your usernames, passwords and credit card numbers. 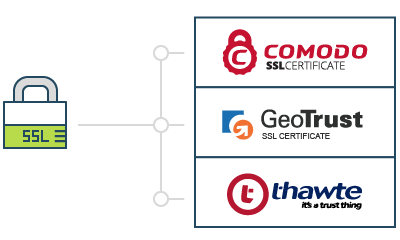 SSL certificates create secure connection.With an SSL all data you enter remains encrypted. Even if hackers get access to your information, they won’t decrypt it. Internet users have become more careful: GlobalSign research shows that 84% of them have never bought anything on a website without an SSL. Such sites lose visitors and money because people leave without buying anything. SSL certificates have become a must for companies of any size.They protect sensitive information and increase your revenue because visitors trust websites with SSL. According to Bloomberg, by 2020 online transactions volume is to grow up to 27.7 trillion USD. However, the number of fraud cases rises too. That is why technology companies are constantly working on protecting their users. Apple requires apps to use secure network connections over HTTPS. Google search robots label websites without SSL certificates as insecure and lower their positions in search results. Google Chrome and Mozilla Firefox flag HTTP pages as “Not Secure”. This way browsers warn visitors that hackers can steal their personal information and money. 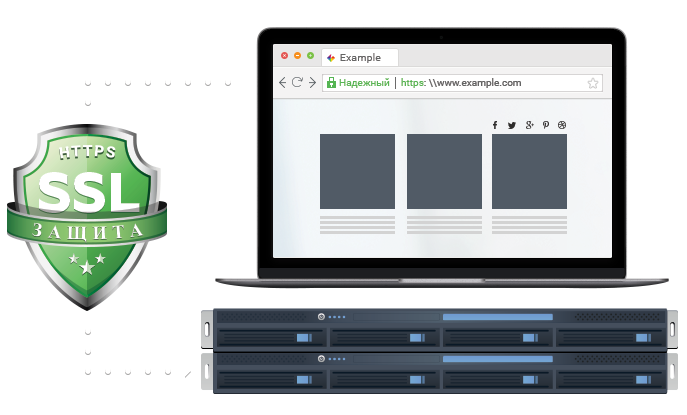 Move your website to HTTPS to improve your search engine ranking, boost visitors trust, and earn more. Choosing an SSL for an average user is a tough question. There are 150 SSL certificates. They all provide HTTPS-connection and high level encryption and support all main browsers. However it doesn’t mean that a bank needs a simple SSL or that a blogger should buy premium protection. 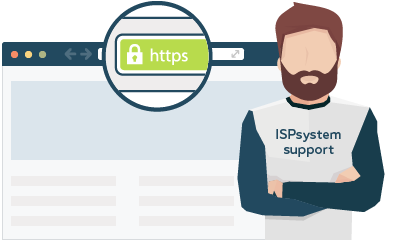 With ISPsystem,it is easy to choose a certificate even for those who know nothing about what SSL means. We have selected 20 of the most reliable and popular certificates. Everyone will find a suitable SSL, whether it is a blogger, a web-store or a software developer. 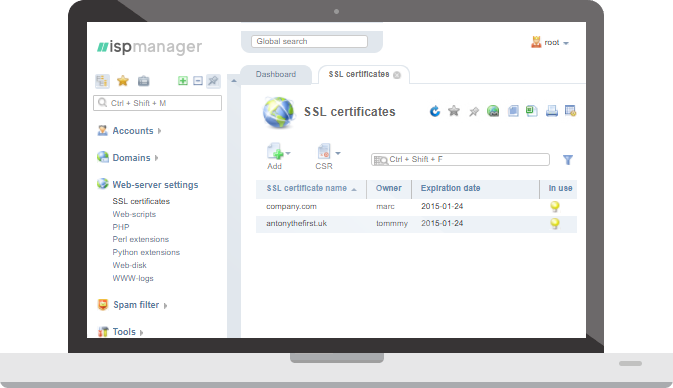 Use our search filters and read our article about how to choose an SSL certificate. 20% of all questions sent to our support team are about SSL certificates. Our team has installed tens of thousands of them, so for us it is as easy as just google it. So if you need help with SSL’s selection or installation, we will be glad to help 24/7. ISPmanager is a control panel which provides rich feature set for managing websites, creating users, handling domains, emails, databases, etc. It allows you to install SSL certificates easily and quickly.